This is a great question and don't feel stupid if you didn't know. 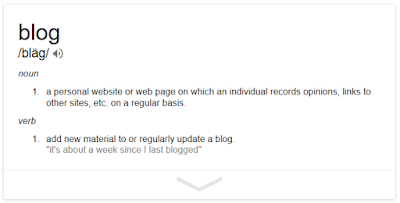 A lot of people have heard of a blog, but don't really know "exactly" what a blog is and frankly, feel silly asking. That's why I thought it would be good to give y'all a 4-1-1 on blogging. Here's how I explain it: I look at a blog like an online journal or diary. I love to write, but I have never been very good about keeping all my thoughts in one place, like a physical diary next to my bed. So instead, I write down story ideas everywhere, in a spiral notebook, in my iPhone notes...on post-its! Then, when I'm ready, I gather everything and start typing away on my computer...and voila, there you go, my blog. as a place to share my life, my experiences, my thoughts, stuff I find funny, stuff I find stupid...pretty much anything I feel like sharing with the rest of the world. My hope is that the person on the other end (YOU) will "get it". Hopefully relate with what I'm writing about and feel a little less alone in this motherhood thing or life in general. People "blog" about all sorts of things: motherhood, travel, fitness, health, money, celebrities, pets, food, music, sports...the possibilities are endless! Everyone has a story to tell or something important to share! I gotta be honest, I've been pretty blown away by the reaction to my blog. Just this past weekend I was amazed at how many people asked me about it. Old friends and new friends, who I had no idea even knew I had a blog, said they were reading it! Pretty cool! So that's pretty much it in a nutshell. If you'd like to find a more detailed description of a blog check out Wikipedia...it might be TLTR (that's short for "too long to read") for some...I'm more into the reader digest version of life, in most cases :). So thanks again for reading, hope you stick with me. I have a REALLY FUN one coming up later this week, so stay tuned and keep LIKING AND SHARING...sharing is CARING!